This Franklite Twista twin wall light in polished chrome with crystal glass shades is ideal for any bedroom, hallway, dining room or living room wall. Featuring a circular mount and curved horizontal arm, with chunky clear crystal glass shades that sparkles when illuminated. Please note that this wall light is not switched. 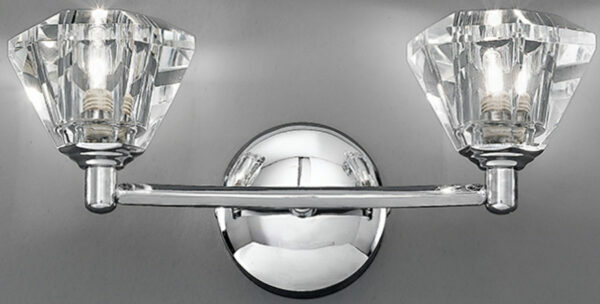 This light is supplied by Franklite Lighting who have been one of the pioneers in the design, manufacture and distribution of high quality lighting such as the Twista twin wall light in polished chrome finish with crystal glass shades you see here.